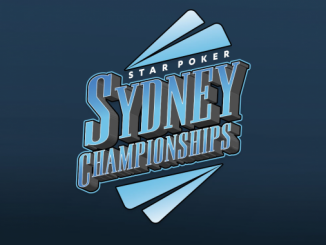 It’s been a long but eventful day here in Sydney for The Star Summer Series main event but after 12 hours of play we’re gradually edging ever closer to the business end of the tournament. Having begun the day with 99 players hoping to stake their claim for the $176,344 top prize, just 18 remain at the end of Day 2 with the money bubble just around the corner (15 will be paid). And while we saw plenty of big names fall by the wayside today – including overnight chip leader Benjamin Zhang – there are still a number of notables left with Daniel Neilson, Billy Argyros, Tam Truong, Andrew Scarf, Joel Feldman and Chad Awerbuch among those to progress to the final day. Very nearly joining them was Sydney Swans captain Adam Goodes who sat amongst the chip leaders for much of the day before slipping right back and eventually busting in 19th place in the final minute of the day. The big winners from Day 2 were our current chip leader Ray Gebrael – who won a big pot from Neilson to become the first player to rocket past 500,000 late in the evening – and Tam Truong who eliminated Zhang when he flopped trips and rivered quad Queens in a massive race against A-K during the final level. Gebrael returns tomorrow with the chip lead and a great chance to, at the very least, push through to the final table. Given that we still have some work to do to get that far tomorrow, the 18 remaining players will return at the earlier than scheduled time of 2pm with play to continue until we crown a new champion. Be sure to join us here at PokerMedia Australia as we bring you all the action from the final day of the 2012 Star Poker Summer Series main event. Daniel Neilson has just ended the tournament of his good mate Jonathan Karamalikis after a classic Aces v Kings confrontation. Karamalikis was already down to his last 80,000 when he got his chips in with K-K and found himself in deep trouble. No King arrived and Neilson is crawling his way back up the leaderboard with 310,000. Overnight chip leader Benjamin Zhang has exited the tournament area after losing a massive pot to Tam Truong (pictured). It was a classic race as the pair traded pre-flop raises before Zhang shoved for his remaining 120,000. Truong thought only briefly before making the call with Q-Q with Zhang showing A-K. The window Ace sent a flutter through Truong’s heart but the Queen that followed saw Zhang need running cards to survive. A 10 on the turn gave him outs to the straight but another Queen on the river gave Truong quads as he rocketed up to 440,000. Ivan Zalac has just tripled up after a three-way all-in that saw Martin Benda eliminated. Desperately short, Benda shoved his last 18,500 into the middle and was called by Joe Cabret in the small blind. Zalac then shoved over the top for another 29,000 with Cabret reluctantly making the call with J-J. He would need plenty of help to crack Zalac’s Aces while Benda was in all sorts of trouble holding K-Q. The board ran out 5-7-8-6-2 and Zalac moves to 120,000. Cabret is down to 90,000 after that hand. The clock has just ticked over into our final level of the day with blinds up to 1200/2400 with a 300 ante. The action has slowed considerably this level with just two eliminations in the last 80 minutes or so. We are now down to 27 players and our final three tables as we near our final 90-minute level of the evening. Ray Gebrael (pictured) and Daniel Neilson have just clashed in a big way with Gebrael emerging victorious to jump out to a huge chip lead. The action started pre-flop when Gebrael limped in middle position and Neilson raised to 7,500. Gebrael came back over the top for 17,500 and Neilson called. The dealer spread a 9-3-6 flop and Neilson called 6,000 c-bet. When the turn brought a Jack, Gebrael bet 16,000 but Neilson re-raised to 45,000. Gebrael thought briefly before calling. The river was a 4 and this time Neilson pulled out a full stack of yellow chips and slid 100,000 into the middle. Gebrael quickly called and tabled Q-J to best Neilson’s suited Q-9. That catapulted Gebrael right up to 490,000 while Neilson dropped down to 150,000. Players have returned for the final two 90-minute levels of today’s play. It was only a few hours ago that tournament director Stephen Ibrahim was desperately hoping that we would at least get down to 30 players remaining by close with no one quite sure how the day would play out given the generous structure. In-fact, we’re already down to 31 players remaining and it will be interesting to see how many more fall by the wayside over the remaining three hours. One thing is for sure – we won’t be reaching our final table tonight – but will the money bubble (15 players are to be paid) burst? Time will tell. Blinds are now at 1000/2000 with a 200 ante. Players are now on a 10-minute break. Reza Vakili has been eliminated after shipping his last 34,000 in with A-10 on a 10-2-2 flop. Martin Benda thought long and hard before eventually making the call with Jacks. The turn was a dagger through Vakili’s heart with a J giving Benda a set and the river 10 was little more than another dagger through Vakili’s heart. Luis Arrilucea was eliminated just moments later on an adjoining table when his A-K lost a race to Sayed Jabbour’s J-J. Leo Boxell battled bravely with a short stack for much of the day but has finally fallen at the hands of Jonathan Karamalikis. It was Karamalikis that opened the action to 3,200 and it was folded to Boxell on the button who 3-bet to 8,000. Karamalikis asked ‘How much do you have behind?’ and after some thought announced “all-in”. Boxell called his remaining 28,000 and tabled K-Q suited to be flipping against Karamalikis’ J-J. The flop provided no help to Boxell as it came 4-2-10 and although he turned extra outs with the turned Ace, the river bricked to send him to the rail. Goodes simply smiled in reply. One player that the rest of the field would prefer didn’t boast a big stack is Jonathan Karamalikis (pictured), but he has just made his presence felt after scoring a big double up at the expense of Mark Darbani. We caught the action with the flop showing K-J-5 and a check-raise from Darbani to 16,500. Karamalikis went into the tank and eventually announced all-in. Darbani made the call and Karamalikis showed A-5 to be in need of help against K-Q. Sure enough, the miracle A peeled on the turn and when river brought a meaningless Q, the 150,000+ pot was shipped to Karamalikis. Darbani was eliminated soon after. Jackson Zheng has bowed out of the Main Event after being crippled in a clash with Nurlan Boobekov. The hand begun with Zheng 3-betting Boobekov’s UTG open, only to be met with a 4-bet. Zheng thought briefly, then moved all-in. His opponent called and the cards were tabled; Zheng showing AK suited to be flipping against his opponents Q-Q. The board ran out 2-2-8-9-9 to leave Zheng to grind a short stack and he was eliminated a few hands later. Blinds are up to 800/1600 with a 200 ante. 8.30pm: I vill Vakili you! Reza Vakili has just added some chips to his growing stack after an interesting clash with Andrew Scarf. It was Mark Darbani that opened the action with a raise to 2,700 with Scarf making the call before Vakili bumped it up to 8,300 from the blinds. Both Darbani and Scarf called. The dealer spread a flop of 7h-6c-5c and it was checked to Scarf who bet 11,500. Vakili re-raised to 23,800 and Darbani folded – as did Scarf after some deliberation. “It was a very good flop for me. Very good. I was calling if you went all-in,” Vakili announced as he showed Qc-8c for the monster draw. He is up to 145,000. Degenerates that they are, Daniel Neilson (pictured) and Jonathan Karamalikis have a crisp $100 bill riding on the winner of tonight’s T20 Big Bash clash between the Sydney Thunder and Sydney Sixers. It’s fair to say, however, that neither are huge T20 fans given Neilson had to ask what colour his Thunder was wearing. The pair flipped a coin to determine who had which team. For the record, Neilson is looming as an ominous presence as we start to go deep with almost 200,000 behind while Karamalikis boasts around 70,000. With blinds now at 600/1200 and a 100 ante, the need to accumulate chips is ever increasing. David Sanis is the latest to have fallen victim to the pressure when he 3-bet all-in an early position raise from Luke Edwards who promptly called holding Q-Q to be in a classic race against David Sanis’ A-K. The board didn’t improve Sanis who has now hit the rail. Play is back underway following the dinner break with blinds at 600/1200 with a 100 ante. We’ve reached the halfway point of the day’s play and the 51 remaining players are off on a 30-minute dinner break. As the clock ticks down to the dinner break after four levels of play on day two of the Star Poker Summer Series Main Event, we just watched one of the bigger pots of the day contested between Jay Kinkade and Tony Kambouroglou. Action started in early position with a raise from David Sanis to 2500. Kinkade three-bet to 6100, then Kambouroglou made it 14,000. Sanis folded, Kinkade bumped it to 28,500 and Kambouroglou called. The dealer raked the chips into the pot already worth more than 60,000 and fanned a flop of A-8-6. Kambouroglou checked, Kinkade fired out 11,100 and Kambouroglou promptly called. The turn brought the 3d – Kinkade checked, Kambouroglou bet and Kinkade called. It went check-check on the river 5h, before Kinkade showed pocket queens. However, Kambouroglou’s pocket kings were good for the monster pot, which consolidated his spot near the top of the count. Jackson Zheng has just won a huge pot and eliminated two opponents in the process, including Martin Kozlov, following a monster pre-flop clash. It was Zheng’s K-K against the 10s and 9s of his rivals as the dealer spread a 3-8-6-8-8 board as Zheng rockets up to 120,000. WSOP bracelet winner Andy Hinrichsen was also eliminated at exactly the same time on an adjoining table, reducing the field to 51 players. We’ve just noticed none other than five-time bracelet winner Jeffrey Lisandro standing at the rail chatting away with Leo and Bev Boxell. Lisandro doesn’t spend a lot of time in Australia these days although you’d never know it from the number of old acquaintances he is catching up with as he wanders around the room. His presence means we currently have two WSOP bracelet winners in the room with the much younger Andy Hinrichsen still grinding a short stack on the table immediately in front of us. A double elimination has just awoken everyone from their early evening slumber with David Sanis the one responsible for setting off the alarm. Sanis raised from early position to 2500 and found one caller to his immediate left. Action folded to the small blind, who moved all-in for 7100 and was called by both players. The flop came A-10-3. Commotion begun when the player to Sanis’ left bet his remaining chips out of turn, David checked forcing his opponent to check. The turn brought the Js. Sanis checked once again and snap called his opponent’s all-in bet and quickly tabled K-Q for the turned nuts. The river blanked and Sanis had eliminated two players; one holding A-K and the other pocket nines. Leo Boxell (pictured below) has been hanging in there today with his wife Bev standing behind at the rail as usual and he just dodged a bullet to keep his tournament afloat – albeit due to a huge fold. Action was folded to a short-stacked Michel Bouskali on the button who shoved his short stack in, with Sayed Jabbour shoving over the top for around 30,000. Incredibly, Boxell open-folded A-K and would have had both opponents dominated given that Bouskali held A-10 and Jabbour K-Q. Luckily for Boxell, a 10 in the window ensured his fold was a profitable one and when the rest of the board bricked Bouskali was back in contention with around 25,000 to his name. The TAB adjacent to the Sports Bar here at The Star looks to have been the major beneficiary as the slow but steady stream of players leaving the tournament area continues throughout the late afternoon on day two. 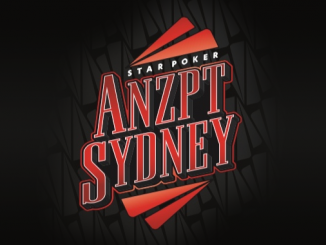 The list of departures has included Star Poker ambassador Aaron Benton, two-time ANZ Player of the Year Tony Hachem, 2012 Sydney Champs winner Dean Yuen, former Aussie Millions winners David Gorr and Tyron Krost along with Sheldon Mayer, Jason Pritchard, Graeme Putt, Dan Guinane, Michael Kanaan and Michael O’Grady. 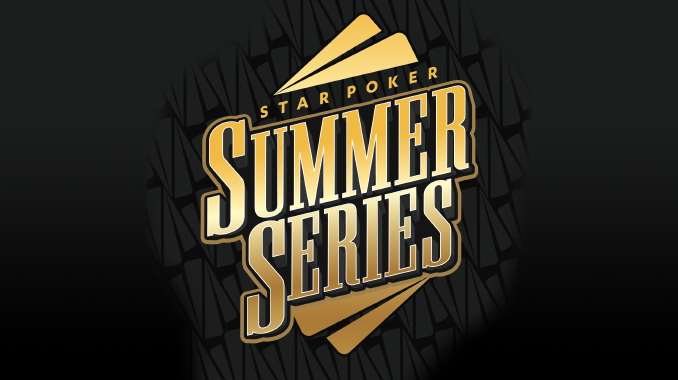 There are 67 players remaining in the Star Poker Summer Series Main Event after just over four hours of play on day two, meaning 32 players have been eliminated. We recently saw the departures of Mike Ivin (his jacks lost a race to A-K) while Manuel Hansimikali collected the scalp of Ali Ghezelbash with his pocket kings prevailing over a flopped pair of jacks. TD Stephen Ibrahim has just popped by to indicate that we’ll be playing up to nine levels today, which will take us through to the early hours of Sunday morning. In short, there’s a long way to go! Players have just returned from their first short break of the day with blinds now up to 400/800 with a 75 ante. We lost 26 players in the first two levels of the day and one more on the first hand back which leaves us with 72 still hoping to add the first place prize of $176,344 to their kitty. The prospect of having AFL superstar and Sydney Swans captain Adam Goodes at the final table of this year’s Summer Series Main Event would be a PR dream for the crew here at The Star and that dream is well and truly alive given his impressive progress today. Having already lifted the premiership trophy in 2012, Goodes has moved up to around 75,000 in chips as he looks to add another piece of silverware to the cabinet. Shortly before the break, we caught Goodes involved in a hand against Alan Taylor. The Swans legend opened to 1500 on the button and was called in the small blind as they took a flop of A-10-4. Taylor checked to Goodes who continued for 2200. Taylor called. When the turn brought a 6, Taylor led for 5500 but Goodes re-raised to 15,500. Taylor mucked and Goodes added a few more chips to his stack. Andrew Scarf has just caused quite a stir over on Table 9 after calling time on Mark Darbani despite not being in the hand and the fact that Darbani hadn’t even been tanking for any extraordinary length of time. The drama developed with the board reading 2-J-A-2 and around 28,000 in the middle. Sayed Jabbour put Darbani to the test with a bet of 24,000 and it was clearly an agonising decision for the former chip leader. After around two minutes, Scarf called time and when the clock eventually ran out Darbani was forced to muck his hand. Alexander Antonios immediately expressed his displeasure at Scarf’s actions, insisting Darbani deserved all the time he needed – and definitely longer than he got – to ponder such a crucial decision. Most of the table agreed, but that matters little now. Darbani is still very healthy with 85,000 while Jabbour moves back up to 60,000 after dropping a heap of chips earlier in the day. Lawford Edwards, who cashed in this event last year, has just reacquired some of the chips he lost after sending Donald Civic to the rail. Edwards committed his last 16,000 with A-5, and Civic made the call showing pocket queens. An ace in the window was enough for Edwards to scoop a nice pot. Meanwhile Jason Pritchard has also been KOed after Tom Pongrass called his all-in four-bet and revealed pocket aces. Yep, Pritchard held kings and watched Pongrass haul a pot worth more than 70,000 after the dealer spread a board of 10-2-10-Q-3. We’ve just completed our first level of the day with blinds now at 300/600 with a 50 ante for Level 7. Nine players hit the rail in Level 6 which means we’re now down to 90. Alec Smith has just won a tidy pot from Lawford Edwards to move to around 70,000 in chips. Smith opened UTG and found two callers in Edwards and Sheldon Mayer in the small blind. The flop came 3s-5d-Ah and Smith continued for 1250 with both players calling. The turn was the Jd and Smith bet 2200 this time with Edwards calling and Sheldon folding. The river was the Kd and this time Smith bet 8500. Edwards tanked briefly before making the call with A-10, but Smith showed the nuts with Ad-7d to rake in a tidy 25,000-chip pot. Edwards dropped to 17,000 after that hand. This year marks the second incarnation of the Star Poker Summer Series although it is the sixth year that a major tournament series has been played here in December with the APPT Grand Final hosted at The Star from 2007-10. We still have two former APPT Sydney champions in today’s field with 2009 winner Aaron Benton (pictured above) and successor Jonathan Karamalikis hoping to become the first repeat victors. Benton currently sits with 60,000 while Karamalikis still has plenty of time to build up his stack of 37,000. Michael Kanaan staged a remarkable recovery yesterday, having finished the day with 30,625 after being down to just 1300 at one stage. However his luck just ran out when he ran his pocket jacks into the 10s of Edgar Montenegro on a 10-8-2 flop. That hand knocked him right back down to 1325 and he was eliminated the very next hand after shipping it with 10-8 against an opponent’s A-K and failing to improve. Still, Kanaan won’t be losing too much sleep given he won an FTOPS jersey and around $197,000 earlier in the week. Nice work if you can get it! 1.20pm: Sleep is for the weak! Much of the talk around the room right now is whether or not we will get down to our final table tonight and, if so, what time that might happen. The extremely generous structure means that even now the average stack of the remaining 96 players is a touch over 100 big blinds so it’s unlikely that we will see a whole heap of eliminations any time soon. More likely is that we’ll play down to the final two tables or possibly until the money bubble bursts (15 will be paid), however we’ll keep you updated as we learn more. In the meantime, we’re buckled up for a long day here at The Star! In addition to the Main Event, there’s plenty of action to keep local punters engaged over the weekend here at Star Poker. At 4pm today, there will be an $1100 High Rollers No Limit Hold’em Satellite with a start stack of 8000 and 25-minute levels. The $10,500 High Rollers event kicks-off at 4pm tomorrow (Sunday). Also on Sunday (at 12.30pm), event nine on the Star Poker Summer Series schedule – the $440 Turbo No Limit Hold’em – will get underway. Numbers on the cash tables have been excellent, so check out the action at Star Poker this weekend. Play is underway on day two of the Star Poker Summer Series Main Event and we’ve noticed a couple of very interesting tables not far from our media desk. Immediately in front of us we’ve got Joel Cohen, Tam Truong, Andy Hinrichsen and Michael Kanaan; one table to our left sits Sheldon Mayer, Alec Smith, Sydney Championships winner Dean Yuen and Billy Argyros while an early contender for table of death features Milan Gurung, Mike Ivin, Michael O’Grady, Martin Kozlov, Errolyn Strang, Daniel Neilson and 2010 winner Jonathan Karamalikis! Sun about to set to Trent’s Summer Series? With just over a fortnight until Christmas, party season was well underway at The Star last night with festive spirit (and a few festive beers) on display throughout the property. The 99 survivors in the Star Poker Summer Series Main Event also had the chance to sample some of the great restaurants and nightspots here after an early finish to play on day 1B. However, it looms as a different story today with a long session likely to reduce the field under the generous structure of this $5000 buy-in No Limit Hold’em event. One player we’ll be keeping a close eye on early today is Trent McClenahan (pictured left). The 27-year-old plays with A-League side Sydney FC, and have a round 10 match scheduled in Wellington tomorrow afternoon – right about the time that the final table should be kicking-off. So where will McClenahan be? Day two action starts at 12.30pm, with the PMA live reporting team of Ben Blaschke, Chris Murphy and Sean Callander on site to follow all the action.